Red Bull Music Academy was a whirlwind month full of staggering events. Spanning a wide variety of genres, showcases, and exhibitions. There was so much happening, I am sure like me you may have found it quite overwhelming. The city was buzzing with creative energies and high profile artists both local and international and saw many first debuts. Including none other than Tiga with his brand new show. He’s the man who has been most prominent in the EDM scene throughout Canada for well over a decade. He paved the way for EDM, both in Montreal and nationwide. This past year saw Tiga release his third studio effort, No Fantasy Required. An appropriate title for Tiga’s latest, proven by his performance at RBMA 2016. Theatre Berri was made home for the night’s lineup. Based off the crowd alone, the energy was high and enthusiastic. Helped a tiny amount by the folk’s eager to get their Halloween celebrations started, what was clear inside Theatre Berri was that this show would be a family affair. Not because everyone came together, but because we were united by one local hero. Tiga (LIVE) kicked off with a major boom and a completely lit crowd. Despite the clear nerves, Tiga jumped right into his set.Turning up the decibels for the packed Theatre Berri, the initial nerves seemed to dissipate with every passing drum loop sequence that would highlight the heavy bass and electronica-centric melodies. On-stage, it took but moments to get in deep with the crowd as the warm welcome back to the home stage was bursting with love and passion. I myself have never seen a crowd as big, or excited inside Theatre Berri. Tiga carried his live vocals perfectly fine, a sure sudden realization that there was nothing to be nervous about, Tiga seemed to loosen up and find himself in the sweet spot a few tracks into the set. Theatre Berri became a surreal playground of electronics stimulating the sense. At times the focus was very much on the vocal performance by Tiga, alongside Hulkkonen. At other moments the focus was put on the staggering light effects and visual projections. It all came together in a type of sensory overload that left you craving more and more. This was my first time seeing Tiga, and I must say it was quite impressive. 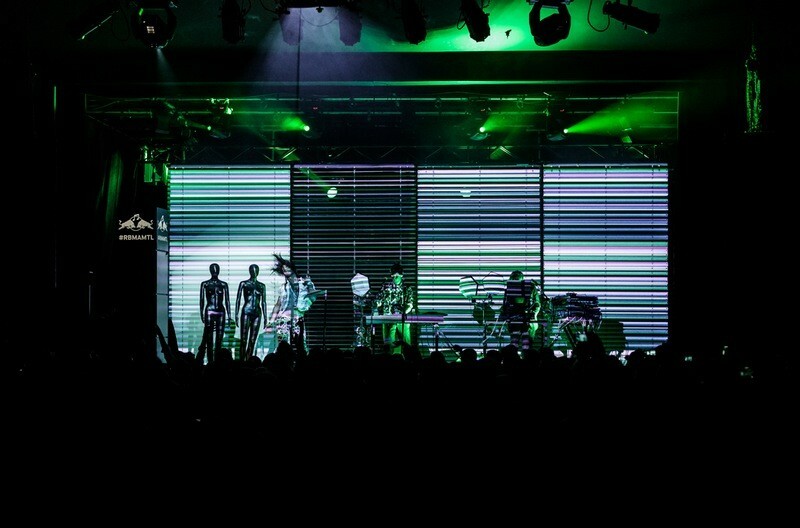 Despite the minor slips vocally, altogether the show felt thought out and an obvious step forward for Tiga’s artistry. It felt natural and organic to his creative process. For this, I tip my hat to you Tiga. Tiga’s record No Fantasy Required is available now, and you should go give it a listen.